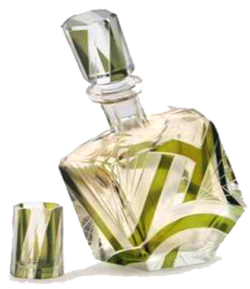 Art Deco glass is for the minimalist collector who wants to collect some of the most stunning glass ever made. So, what makes a piece of glass Art Deco Glass? Well, Art Deco is a name derived from an exhibition in Paris in 1925 (the Exposition des Arts Decoratifs et industriels Modernes). Where the finest French artists exhibited their extravangant glass sculptures in this new style. It has been referred to as the perfect expression of the extravagance of Paris during the 1920’s and is renowned for its opulence and exclusivity. 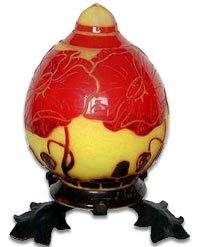 Art Deco glass uses geometric patterns, bold colours, exuberant, sometimes stylised, female figures, and animal motifs. 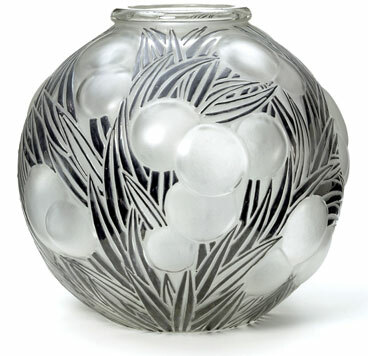 Major designers of Art Deco glass were Rene Lalique, Maurice Marinot, Daum Freres, Marius Sabino, Etling, Schneider, Gabriel Argy-Rousseau, and Francois Decorchemont. In Sweden Art Deco glass was made by Orrefors, in Britain it was produced by Joblings, Bagley, Stevens & Williams, Davidson, Sowerby, and Moncrieff. In Belgium there was a series of Art Deco pieces made by Val St. Lambert, and in Germany it was made by Auguste Walther and Sohne. In Britain art deco glass was produced by Joblings, Bagley, Stevens & Williams, Davidson, Sowerby, and Moncrieff. In the 1920s Rene Lalique became famous for his work in Art Deco Glass and he was responsible for the walls of lighted glass and the elegant glass columns that filled the dining room and grand salon of the SS Normandie. Lalique also produced some very collectable art deco glass mascots. 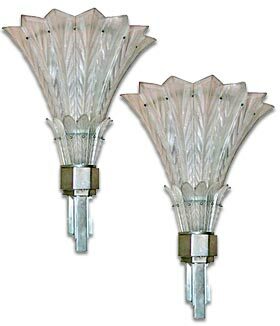 A fine Pair of art deco wall lights by Sabino, France c1925. With frosted glass shades and silvered bronze sconces. Marked “Sabimo Paris”, “Made in France”. Press-moulded glass with black enamels. French, 1926. Made at the Lalique glassworks (Verrerie d’Alsace). 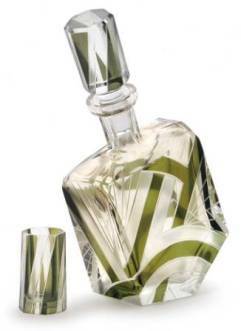 A Bohemian Art Deco cut and flashed glass decanter with six glasses. Height: decanter 9 3/8ins/23.7cms; glass 2 9/16ins/6.5cms. 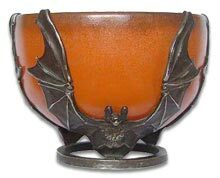 Fine and rare Art Deco enamelled glass bowl in a silver plated bronze mount in the form of three bats. Art Deco Glass, as you can see from the above examples is really quite stunning. When collecting make sure to check every piece for damage as any damage can drastically affect the value of even the nicest pieces.